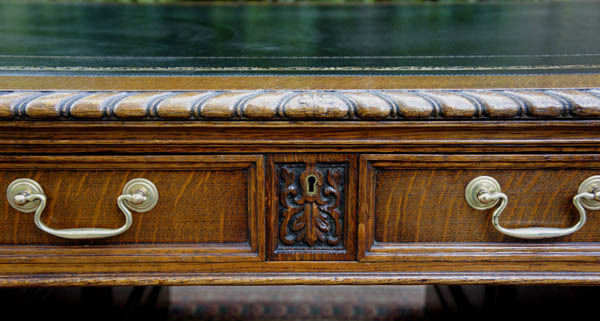 Buying an antique desk can be a daunting undertaking if you are unsure where to start. We have a few pointer here to help you think through what to look for in a desk and a suppler. We would suggest finding a reputable antique dealer rather than risking a purchase from an online auction site whos descriptions may not be accurate. We have seen reproduction furniture being sold as authentic, and production dates wildly out. Unless you have some knowledge of what you are looking at and expertise in assessing antique furniture it can be a mine field. So we would recommend finding an antique furniture dealer who offers customer protection, has a returns policy if you are not happy and can supply a certificate of authenticity on the age and description of the piece you are buying. Look for a business that has the backing of a professional association such as LAPADA, or CINOA, which operates by a strict code of conduct. Many people value the beauty, quality and expert workmanship that antique furniture has to offer. 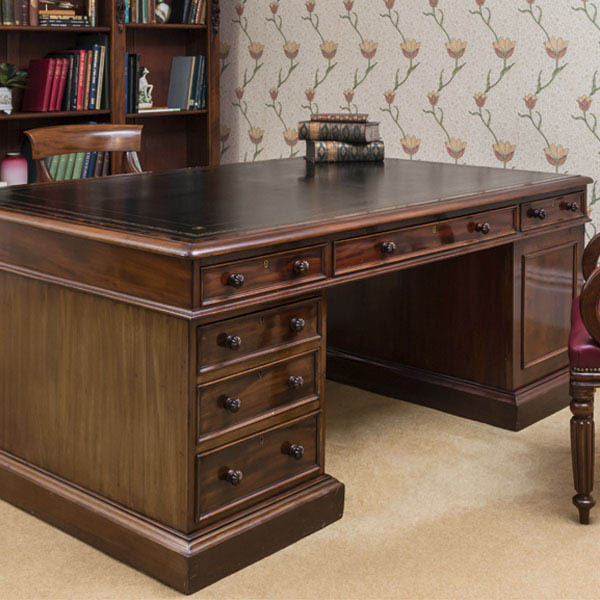 They choose to invest in good quality antique furniture and despite a recent slump in ‘brown furniture’ antique desks have never really gone out of fashion and have always remained popular in Europe, USA and Canada. If you are looking at a piece of furniture take your time and consider whether it is indeed authentic. What is the condition? Is it structurally sound but with evidence of use in keeping with its age? Does the veneer or timber of the top match that of the base? Does the piece look in proportion? Some pieces have been altered in the past and some made up of two or more pieces (marriages) in order to make them more saleable or desirable. We sometimes see small antique desks and writing tables that have been converted from dressing tables or washstands as these are less commercial. One indicator of this conversion is the fixed construction of the piece. Even a small antique desk would often have been constructed with separate pedestals for ease of installation (excluding knee-hole or davenports) whereas the dressing table would normally be one piece without a separate top and without a polished back. 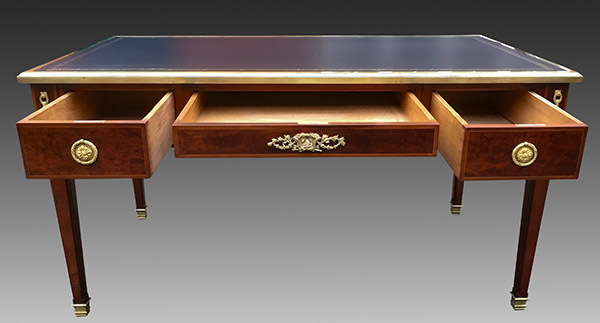 We are of course happy to talk to you about our desk and explain the reason they have been valued as they have been. If you would like to view our desk we would be delighted to welcome you to look around and browse all our stock. 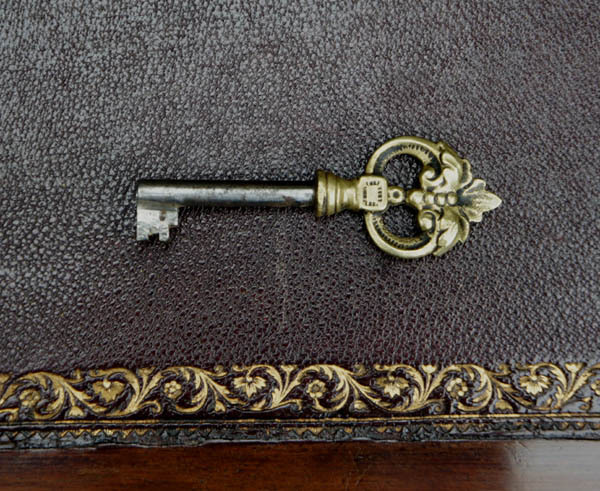 Although you would need some antique knowledge to estimate the age of a piece from its style and construction, you can look for signs of use inside the drawers, ink stains and wear marks. A genuine old desk or table should show signs of wear on the body with knocks and bumps from chairs etc. especially if they have been used in a place of work such, as an office. These signs of age and use should be visible even after restoration as they are part of their character. If an antique desk or table looks fairly new it is probably a reproduction. Furniture made from good quality Mahogany will always command a high price. Mahogany has always been a popular choice for furniture because of its strength. It has tremendous density because of the lack of knots and holes in the grain of the wood. Mahogany also has the properties that will keep it from succumbing to woodworm or areas that are prone to wet weather or humidity. Many antique desks and tables that have survived the centuries are made from mahogany and these can last for hundreds of years if they are taken care of. Look for solid good quality wood or thicker veneers. Earlier in the 19th century quality timber was more readily available and veneers were cut more thickly so tended to have more attractive figuring and the drawer linings would be made in oak, mahogany and cedar. A good indicator of quality are the drawer linings, those made in oak, mahogany and cedar are generally best. 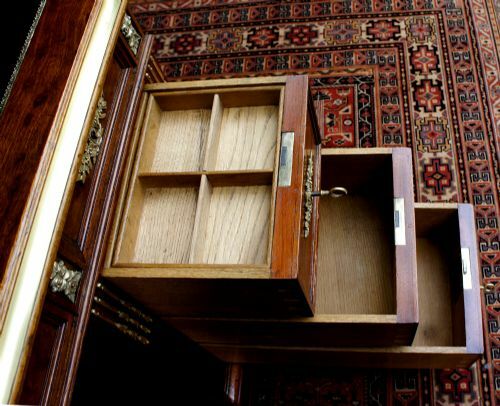 Also most antique cabinet work has been crafted by hand and the drawers have small fine dovetailed joints. If you see thick wide dovetails this suggests they have been machine made. If the piece has the original locks, and especially if they are stamped with the manufacturers name this is also an indicator of good quality. N.B. Most old desks have been restored at least once during their life and this is not going to detract from the authenticity of the piece. French polished or waxed finish, not polyurethane varnish! 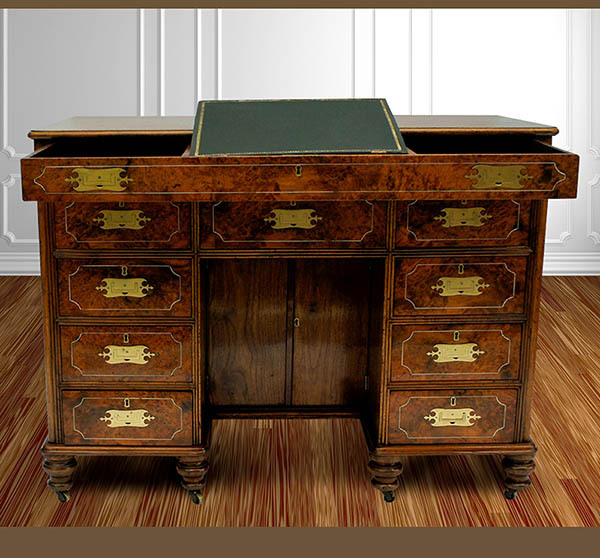 What affects the value of an antique desk? When buying an antique piece of furniture the age and condition are important as is the quality of workmanship and whether it can be attributed to an important recognized furniture maker such as Chippendale, Gillows or Edwards and Roberts. There are also some styles that never go out of fashion and the size will also determine price. Desks with original leather writing surface in good condition are hard to come by. Some people love these others like a new leather in a colour of their choice. In restoration we try to retain the original leathers, but the leathers are often much worn and need replacing. If you would like to discuss any of our pieces of furniture please feel free to contact by email or telephone us for a chat.